AMD launched a new breed of desktop processor just last week. Built by bringing together a quad-core CPU and DX11-capable graphics on to one piece of silicon, the consensus has been one of AMD doing enough with the A6 and A8 chips to warrant serious consideration for your next mid-range build. But one area which AMD has ignored, initially at least, for the premium A6 and A8 APUs is manufacturer-based overclocking. Intel brings it to play with select Core chips through frequency management of both the CPU and GPU, yet AMD, while including Turbo CORE enhancements on lower models, doesn't bother offering pre-built tweaking for the A8-3850 and A6-3650; a decided shame as both APUs ship with a lusty 100W TDP. Indeed, think of the A8-3850 in particular, which we did in our in-depth review, and the maximum multiplier one can choose in any FM1-supporting motherboard's BIOS is 29x, irrespective of what monitoring applications may say, and it so happens to be the default multiplier of the APU, which runs a 100MHz master-bus speed. This means the chip is multiplier-locked in an upward sense. Understanding the tight integration and coupling of the constituent parts of an APU - CPU and GPU, primarily - are inextricably tied together, does this mean that overclocking potential is limited? The answer is no, because, like Intel, AMD can choose to release a multiplier-unlocked version of the APU that'll enable an enthusiast to crank up the multiplier while keeping the master bus at the default 100MHz. One could, say, jump to 36x100MHz (3,600MHz), CPU permitting, but AMD has made no mention of releasing an APU 'Black Edition' part yet. The other method of pulling more speed from the APU is to increase this master-bus speed beyond 100MHz. You can do this with Intel's latest Core processors, but such is the intertwined nature of the chip, that going much past 105MHz is fraught with system instability. AMD has previously mentioned to HEXUS that its Llano microarchitecture (that's an A4, A6 or A8 APU, for those who don't know) is far more resilient to changes in the master-bus speed than Intel's, bringing us back to the halcyon days of FSB-based overclocking. Boosting the base clock to 133MHz isn't uncommon, says the company, but points out that just how far you'll get depends upon how the motherboard manufacturer has implemented clock dividers. Remember how we mentioned that an APU's architecture is intertwined? This fact is both a boon and a curse, depending upon which motherboard is used. For example, cranking a chip up to 133MHz (master clock) increases the CPU core speed, RAM frequency, GPU clock, and a multitude of buses - PCIe, SATA, USB, for starters - by 33 per cent, causing them to be, potentially, seriously out of whack or perfectly stable, depending upon the aforementioned dividers and locks. AMD says that pushing up the master clock on some motherboards may cause hard-drive detection problems and USB ports to malfunction: not good stuff, clearly. However, some boards may introduce a bus-lock at set speeds - 133MHz being the prime example, going by history. Whether or not a particular board introduces a bus-lock at a certain speed is something that can only be proved empirically and scientifically through the use of a 'scope, though. How does this all pan out in the real world, you may ask? Imagine you have an A8-3850 chip on an FM1 motherboard. 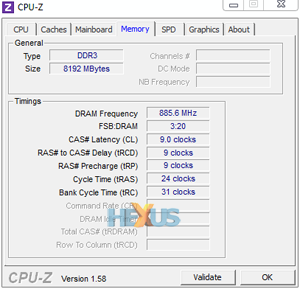 Increase the master clock to 133MHz without touching any other options and you'll have the APU running at an improbable 3,857MHz (29x133), the GPU pushed from 600MHz to 798MHz, and DDR3-1,333 memory up to 1,772MHz - they're all linked, remember. But you still have the option of reducing (yet not increasing) the CPU's multiplier such that, say, a 27x multiplier will give a final speed of 3,591MHz, and you can choose to run the memory at even slower speeds to compensate for the hike introduced by jacking up the master clock. We used an ASRock A75-Pro4 motherboard (BIOS v1.41C) for our overclocking testing, making it the backbone of our system for pushing the range-topping A8-3850 past its nominal speeds. After tinkering around with the settings and evaluating just what worked and what did not, we settled on reducing the CPU's multiplier to 27x, ramping up the master/base clock to 133MHz, and setting the memory to DDR3-1,333 in the BIOS, resulting in the same 1,772MHz speed highlighted in our hypothetical example, above. It's actually difficult to determine whether the ASRock board provides a divider at, or near, 133MHz. We say this because the system would very, very sporadically reboot, fail, or lose the use of the USB 3.0 ports, indicating that not all was well. Reducing the multiplier had no real effect on long-term stability. Pushing the master clock down to 110MHz and increasing the multiplier didn't ameliorate the occasional problems, either. But the system was good enough to run all of our benchmarks, one after the other, without crashing, and it was only through long-term stability torture tests that failures became apparent. We'd normally insist on a 100 per cent stable system (which in itself is practically impossible to guarantee) before spewing out benchmarks, but felt that the PC was in good enough shape to provide you with some numbers. Naturally, your overclocking mileage may, and probably will, vary. As a recap, we've overclocked the A8-3850 APU by dropping the multiplier from 29x to 27x, raising the master clock from 100MHz to 133MHz and, consequently, graphics speed from 600MHz to 798MHz and memory from 1,333MHz to 1,772MHz (9-9-9-24-2T) timings. But to give you completeness, we've also benchmarked the system with the CPU at near-default speeds. 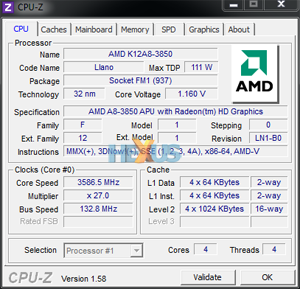 Here the same overclocking protocol has been used but the multiplier is reduced to 22x, giving a final speed of 2,933MHz. Voltages are kept to defaults. Doing this shows you the benefits of increasing the bus, graphics and memory speeds while keeping the CPU fairly constant. Full comparison system specifications can be found here.